We celebrate the spring equinox season through Easter, which in Christian tradition marks the resurrection of the divine Jesus Christ. According to the Gospels, this event indeed took place in the spring (on the day of the Passover Sabbath in the Synoptic gospels; on the eve of that Sabbath according to the gospel of John). Mythological traditions in ancient and medieval non-Christian cultures, however, often celebrated this season not through a god, but through a goddess of spring. In fact, the name Easter is derived from that goddess, Eostre. In most of Christianity, the Easter holiday is called some form of Pascha, the Greek word for Passover that is derived (via Aramaic) from the Hebrew word for Passover (Pesaḥ), so it has Semitic roots. Our word Easter, however, has roots in northern Europe, ultimately deriving from the Proto-Indo-European root *aus meaning “to shine,” especially of the dawn, which is the etymology of Eos and Aurora, the ancient Greek and Roman goddesses of dawn respectively. This root eventually led to Proto-Germanic *aust (“east,” or “toward the sunrise”) and *austron (“dawn”). In Anglo-Saxon England this etymology is reflected in Eastre or (in Northumbria) Eostre, the names of the goddess. Eosturmonath has a name which is now translated “Paschal month,” and which was once called after a goddess of theirs named Eostre, in whose honor feasts were celebrated in that month. Now they designated that Paschal season by her name, calling the joys of the new rite by the time-honored name of the old observance. The great Christian festival, which usually falls in April or the end of March, bears in the oldest of [Old High German] remains the name ostara. . . . This Ostara, like [the Anglo-Saxon] Eastre, must in heathen religion have denoted a higher being, whose worship was so firmly rooted, that the Christian teachers tolerated the name, and applied it to one of their own grandest anniversaries. . . . Ostara, Eastre seems therefore to have been the divinity of the radiant dawn, of upspringing light, a spectacle that brings joy and blessing, whose meaning could be easily adapted by the resurrection-day of the Christian’s God. In the 1950s we learned more about this goddess from an archeological discovery near the former villages of Morken and Harff in Germany. The archaeologists found a number of votive inscriptions from ca. 150-250 CE dedicated to a deity(ies?) named the matron Austriahena, which is etymologically connected with Eostre/Ostara. Modern idealized representation of Eostre, associating her with hares. In Ireland and northern England, Easter was celebrated on a date different from that set by the Roman church, apparently retaining the original date of Eostre’s feast, but the Pope gradually brought these maverick lands into line in the course of the 7th and early 8th centuries. The date of Easter is linked to the local mythology of the lunar cycle. Easter is the first Sunday after the first astronomical full moon after the spring equinox. In Eostre’s time, this first full moon after the equinox symbolized the “pregnant” phase of the goddess heading into the fertile growing season. In connection with the Easter Bunny, it is often claimed that Eostre was associated with hares, which in turn (actually) also are connected with the moon. 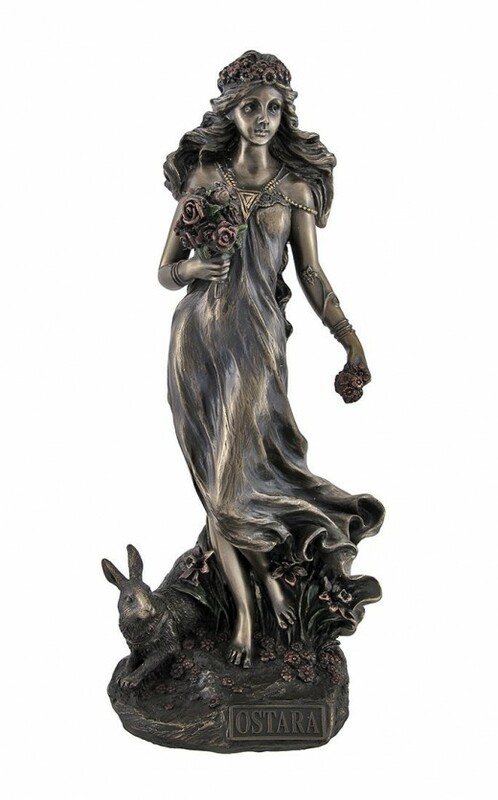 This sounds logical for such a spring goddess since hares (due to their extraordinary reproductive capacity) are symbols of everlasting renewal, and goddesses in their maternal aspect are found portrayed with rabbits. But so far I have found no specific ancient evidence that Eostre in particular was associated with the hare. There are parallel spring goddesses in other cultures, too numerous to mention here, so I’ll mention only one because of my Slavic studies background. This parallel is Vesna, the Slavic goddess of spring and fertility. (In Russian the word for spring is vesna, cf. Proto-Indo-European *wesr – “spring”.) She was always paired with the winter and death goddess Morena (also called Marzanna). Vesna was accordingly venerated each spring for having defeated death and winter. Her battle with and defeat of Morena was reenacted in spring rituals by setting an effigy of Morena on fire. Vesna’s name also seems to signify light, like Eostre marking the return of light after the period of winter darkness. In more northern climates where Eostre and Vesna flourished, the winter darkness is more pronounced than around the Mediterranean, hence the importance of the motif. In sum, historically in northern Europe this spring equinox season was deeply rooted in goddess traditions. Our Easter acquired its name only when the goddess’s name was given to it. This helped the new Christian converts of the land accept and adapt to the “new” holiday. This entry was posted in Christianity, Goddess, Holidays and tagged Bede, Christ, Earth Goddess, Easter, Easter Bunny, Eastre, Eostre, Eosturmonath, goddess, Grimm, Marzanna, matron Austriahena, Morena, Ostara, Pascha, Passover, Vesna. Bookmark the permalink. Nice piece. So glad you didn’t get into the whole Astarte thing I see so often confused with Easter. Thanks. Yes, I too keep seeing claims that Eostre is derived from Astarte, but never with any good explanation. Presumably some people see an etymological connection because of a seeming similarity in the names, but there can’t be a true etymological connection since Ishtar/Astarte is Semitic, while Eostre is Indo-European. And the goddesses are quite different. Yes, I’ve heard “well they sound alike, they must be related” then very much have to explain the language bit too.